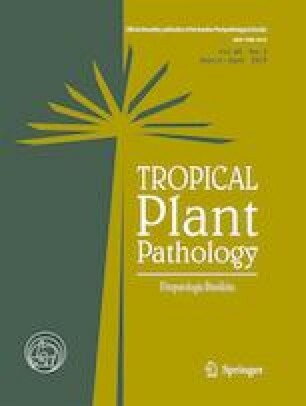 Species of Pestalotiopsis have been reported to be pathogenic to eucalypt, yet few studies have addressed their real pathogenic potential or even their diagnosis. The objective of this study was to carry out the molecular, micromorphological, physiological and pathogenic characterization of four isolates of Pestalotiopsis sp. found in eucalypt leaf spots. DNA from the isolates was extracted and PCR amplified using primers for the internal transcribed spacer (ITS), partial β-tubulin (TUB) and translation elongation factor 1-alpha (EF1-α) gene regions. For morphophysiological characterization, the fungal structures were measured and isolates evaluated for mycelial growth and sporulation under different light regimes (0, 12, and 24 h). Pathogenicity tests were conducted on healthy eucalypt leaves. The results revealed that (a) the amplified ITS region is too conserved to be used for identification of Pestalotiopsis species, and thus, TUB and EF1-α sequences are recommended for this purpose; (b) based on micromorphological characteristics and DNA sequences, the four isolates were identified as the new species Pestalotiopsis grandis-urophylla; (c) P. grandis-urophylla presents faster mycelial growth when cultivated in the dark, but for mass production of inoculum the light regime does not have a strong influence; and (d) the pathogenic potential varied among the P. grandis-urophylla isolates. The authors thank the Fundação de Amparo à Pesquisa do Estado de Goiás (FAPEG) and the Coordenação de Aperfeiçoamento de Pessoal de Nível Superior (CAPES) for the postdoctoral scholarship to Daniel D. C. Carvalho, and the Universidade Federal de Goiás (UFG) and Universidade Estadual de Goiás (UEG) for the institutional support.